Despite advances in solution chemistry, little is known about the chemical reactions in confined porous media like compacted clay, where the proportion of liquid is much smaller than that of solid. In this study, gypsum precipitation in low-permeable compacted clay was explored through a novel electrokinetic method. Montmorillonite is a clay mineral and has a negative charge in a layer structure. The negative charge is compensated by exchangeable cations (mainly Na+ and Ca2+ ions) sandwiched between the layers, termed Na/Ca-mixed montmorillonite. 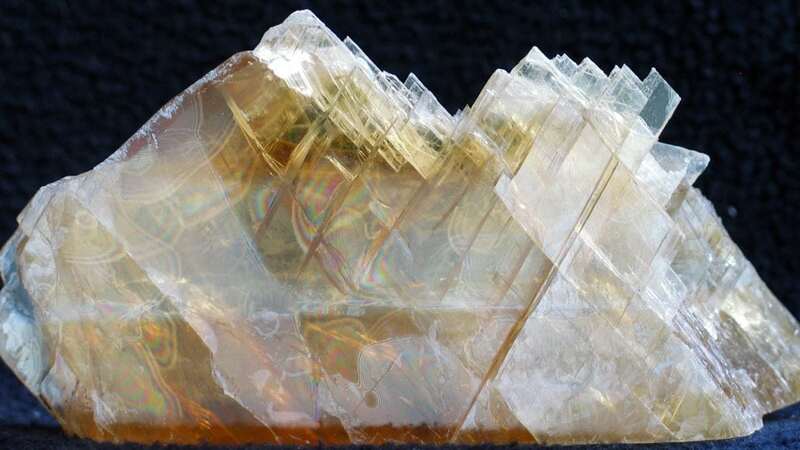 Exchangeable cations in montmorillonite are hydrated when they come into contact with water, causing the mineral to swell. The swelling property is suitable for various barriers including liner sheet (GCLs: geosynthetic clay liners) and buffer materials for the geological disposal of high-level radioactive waste. At the latter, an understanding of the long-term (tens of thousands of year) chemical reactions in the compacted montmorillonite is important for evaluating alterations of barrier functions. Unwanted gypsum precipitation named “water scale” is problematic in industrial fields, and has been investigated since the nineteenth century, in efforts to understand and control its precipitation from a solution. In this study, the well-known gypsum precipitation reaction was chosen for investigating the chemical reaction in compacted montmorillonite. Due to its low permeability, it is difficult to precipitate gypsum by conventional diffusion or hydraulic methods. 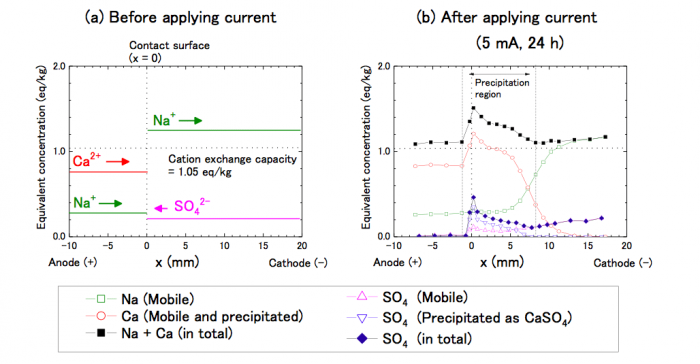 In contrast, the electrokinetic method enhances gypsum precipitation as SO42- ions migrate in the opposite direction from that of Ca2+ under an electric potential gradient (electric current). In the experiment, Na/Ca-mixed montmorillonite saturated with water was in contact with Na-montmorillonite saturated with 0.5 M Na2SO4 solution. After a current was applied, Na+ and Ca2+ ions migrated to the cathode (-), and in contrast, SO42- ions migrated to the anode (+). Some Ca2+ ions encountered SO42- ions and precipitated as gypsum. The Ca2+ and SO42- peaks emerged around the contact surface, indicating gypsum precipitation around the region. The gypsum precipitation was examined using electron probe microanalysis (EPMA) conducted 0-1 mm from the contact surface. A large aggregate approximately 300 μm in size infiltrated into the montmorillonite texture. The white spot observed in the backscattered electron (BSE) image was in good agreement with Ca and S in the elemental maps, suggesting that gypsum precipitated in the area. In contrast, the Si, Al, and Mg derived from the montmorillonite structure were absent from the spot. 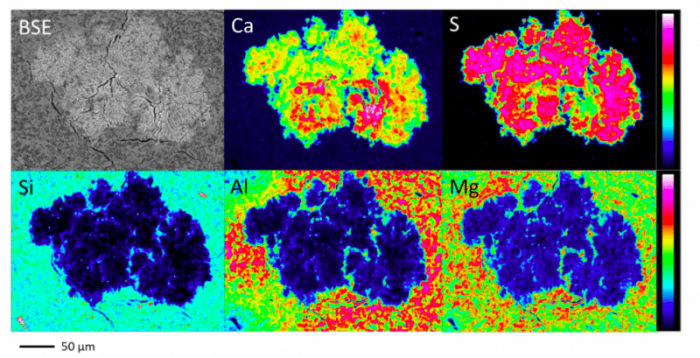 The aggregate grew into a highly branched fractal-like structure by adding randomly moving Ca2+ and SO42- ions as raw materials, which may be a process termed diffusion limited aggregation. Gypsum precipitation and porewater chemistry were discussed in detail based on a model including anion exclusion, cation exchange, and ion-pair formation. It was demonstrated that gypsum precipitation in the low-permeability compacted clay was successfully enhanced using an electrokinetic method. It is hoped that this new method and the discussion on gypsum precipitation will be of assistance to future works dealing with porewater chemistry in compacted clay and other porous media. These findings are described in the article entitled Gypsum precipitation enhanced by electrokinetic method and porewater chemistry in compacted montmorillonite, recently published in the journal Applied Clay Science. 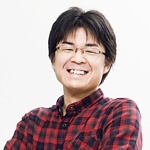 This work was conducted by Shingo Tanaka from Hokkaido University.